Posted on Tue, Feb 28, 2012 : 5:14 a.m.
New York City-based art videographer Charles Atlas’ “Joints 4tet for Ensemble” at the University of Michigan Institute for the Humanities is one of those art installations whose back story makes the whole affair that much more comprehensible—and interesting. The setup is simple enough: The Institute for the Humanities’ gallery houses 10 video monitors set on stands of varying heights. Videos loops successively focus on parts of the human body—elbow, knee, ankle, hand. End of story. But in this instance, the story’s ending is also the beginning of an exceedingly adventurous artwork. For as the institute's Amanda Krugliak tells us, “Joints 4tet for Ensemble” is far more than the sum of its video parts. “In the early 1970s,” writes Krugliak of the exhibit, “a twenty-something Charles Atlas went to work as an assistant stage manager for the Merce Cunningham dance company. Before long, the two began what would become an ongoing collaboration making films and video. Atlas coined their new way of working as ‘media dance,’ where a choreographer creates specifically for film or video. Well, not quite. For as Atlas told visual artist and curator Gary Wiseman of Portlandart.net in a 2010 interview, his art’s motive lies in its planned arbitrariness. So Atlas' installation works through this intersection of planning and chance. 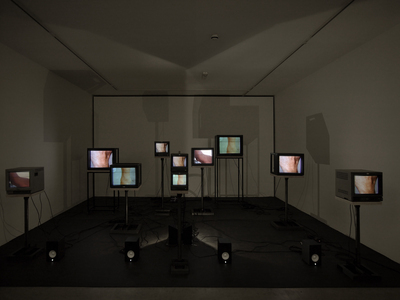 The videos’ discontinuous footage continually disrupts the installation’s narrative—multiplying this disruption by 10 monitors.And Cage’s random-sounding urban soundtrack cuts into and out of the atmosphere, creating an aural texture for the work. Yet the flexing of the limbs themselves cannot be completely arbitrary, since the human body can only allow for certain reasonable physical transition—and Atlas’ film focuses on these movements. There is indeed only so much chance that the image itself presents the viewer. What subtly lies in between is Atlas’ contribution. The seeming random, continual uncoiling of the film loop bends Cunningham’s dance in and out of order. Up to a point. Two or three of the 10 monitors may be running an identical video loop, while other monitors are running the film leader, and yet other monitors bend Cunningham’s joints in other patterns. Atlas therefore gets to simultaneously have his direction and disruption take place at the same time, while Cunningham gets to follow through with his chance ‘media dance’ in multiple forms. It’s only by sitting in the Institute for the Humanities gallery and watching this wiggle of disruptions shuffle in repetitively similar, yet ultimately disjointed, patterns that the whole begins to create a sense of artful harmony. And one senses that Atlas and Cunningham wouldn’t want their poetic license any other way. “Joints 4tet for Ensemble” will continue through March 31 at the University of Michigan Institute for the Humanities’ Exhibition Space, Room 1010, 202 S. Thayer St. Gallery hours are 9 a.m. to 5 p.m., Monday-Friday. For information, call 734-936-3518.